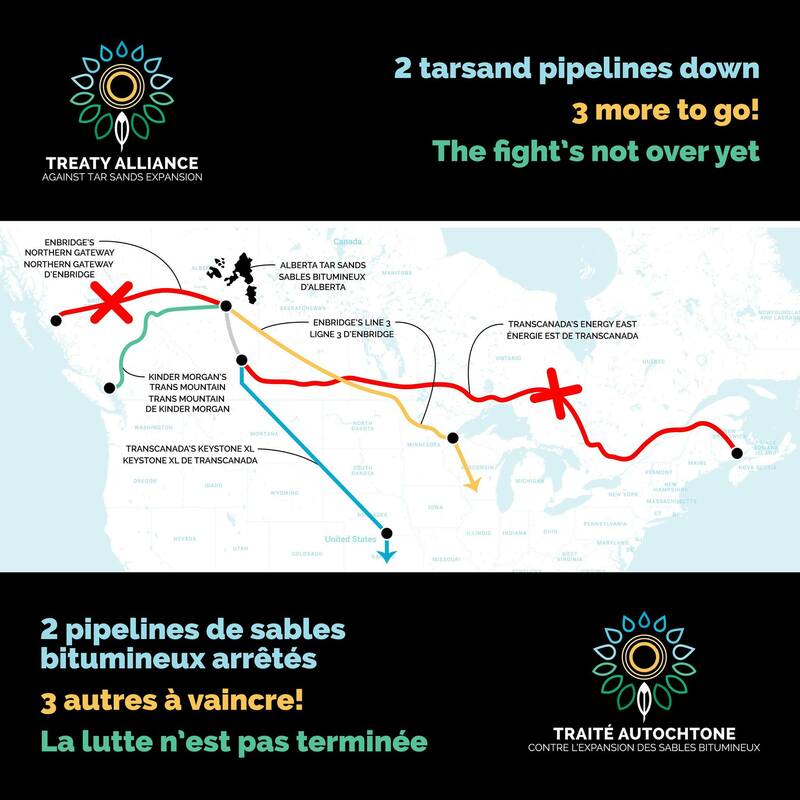 It was a huge victory that TransCanada gave up on its Energy East #tarsands pipeline in the face of massive Indigenous and allied resistance. The 150 Indigenous Nations who have signed the Treaty Alliance Against Tar Sands Expansion want to remind everyone though that the fight’s not over. We have 3 more #tarsands pipelines to stop to truly be able to declare victory in this fight for Indigenous rights and the planet. Also, big shout-out at this moment of victory to all the Indigenous grassroots leaders, the women, the youth and the elders from frontline communities that have been fighting #tarsands for years and still today, standing in defense of their lands, waters and future generations – well before the pipeline battles. Thank you as well to all the grassroots leaders and water protectors leading the charge against the pipelines – like the Tiny House Warriors. And big thanks to all the people that have been leading and supporting the Treaty Alliance in its fight against all the pipelines, just a few being Yinka Dene Alliance, Geraldine Flurer , Jasmine Thomas , Terry Teegee , Serge Otsi Simon , UBCIC , Tsleil-Waututh Nation Sacred Trust , Rueben George , Charlene Aleck , Ghislain Picard , Derek Nepinak , Assembly of Manitoba Chiefs , Kevin T. Hart , Winona LaDuke , Jordan Gardner , Patricia BigGeorge , West Coast Environmental Law , Isaac Murdoch , Pam Palmater and of course the unstoppable Autumn Peltier and her mom Peltier Stephanie + so many more. Kinder Morgan, Line 3 and KXL: you’re next. This entry was posted in Events, Tribal Leadership by lrinspire. Bookmark the permalink.